A church member and friend has coerced me into reading a book by Fenelon, “Letting Go: to get peace and real joy”. I say coerced because I know he asked me to dig through it (short but stout) because of my desire to control aspects of life that, well… are in need of God’s continual control. Say, like pastoring a church plant that is the living body of Christ. It is a brief book of letters written by Francois de Salignac de La Mothe Fenelon, the Archbishop of Cambrai, France during the seventeenth century. He was writing to a small group of people at the Court of Louis the Fourteenth. Apparently they lived in a world of shameless immorality and struggle, kinda like us. Try his words on for size and may they be a blessing to you. The good that comes from any experience of personal weakness is the realization that God wants us to be lowly and obedient. So may the Lord keep you! I am amazed at the power that comes to us through suffering; we are worth nothing without the cross. Of course, I tremble and agonize while it lasts, and all my words about the beneficial effects of suffering vanish under torture. But when it is all over, I look back on the experience with deep appreciation, and am ashamed that I abore it with so much bitterness. I am learning a great deal from my own foolishness! The great Physician who sees in us what we cannot see, knows exactly where to place the knife. He cuts away that which we are most reluctant to give up. And how it hurts! But we must remember that pain is only felt where there is life, and where there is life is just the place where death is needed. Our Father wastes no time by cutting into parts which are already dead. Do not misunderstand me: He wants you to live abundantly, but this can only be accomplished by allowing Him to cut into that fleshly part of you which is still stubbornly clinging to life. Learn to cultivate peace. And you can do this by learning to turn a deaf ear to your own ambitions and thoughts. Or haven’t you yet learned that the strivings of the human mind not only impair the health of the body, but also bring dryness to the soul. Love of self, which the world advocates, is a thousand times more dangerous than any poison. Be careful about your motives in this eager chase for knowledge. You are aware, aren’t you, that all we need is to be poor in spirit, and to know nothing but Christ and him crucified. Although being a know-it-all makes us feel important, what is really needed to strengthen Christian character is love. You certainly don’t think it possible that the love of God and the dethroning of self can only be reached through the acquisition of knowledge. You already have more knowledge than you can use. You would do better to put into practice what you already know. Oh how we deceive ourselves when we suppose that we are growing in grace because our vain curiosity is being gratified by the enlightenment of our intellect! We need to be humble, and to understand that we cannot receive God’s gifts from man. The love of God comes to us only from Jesus. I write this prayer letter to connect with you. Maybe it will happen, maybe not. After all, writing only works if a connection is made. Every now and again, I read a book and the author’s semantic style or sense of humor or something magnetically attracts all of me to all of what he/she has to say. Have you ever read a book wherein the words moved (as though living) from a mere place on paper to a central place in your thoughts? Have you ever discovered your elusive stream of consciousness through a coherent combination of vowels and consonants? Have you ever had a page of prose or poetry expose and interpret your childhood memories? I was browsing a bookstore one day when I happened upon a topographical map of Colorado, molded in plastic. A yellow line representing Interstate 25 ran down the center, dividing the map in half. I stooped to pick it up and ran my fingers across its surface. The eastern half had barely a dimple on the landscape. The western half had peaks and valleys that formed the southern range of the Rocky Mountains. Smooth, even terrain… and bumpy, uncertain terrain. Life as we would want it… and life as we are given it. The physical landscape [of Colorado] was a metaphor of the landscape of our lives. One had no upheavals. The other was full of them. I grew up on Interstate 25 in Colorado. To the West of our home in Fort Collins was Horsetooth mountain and reservoir. To the East were the wind-swept plains, the Kansas-like and rarely-mentioned expanse of Colorado. On our day trips to Denver, the view out one window afforded a sense of awe, the other a sense of “are we there yet.” The point of Gire’s landscape parable is simply that in life – we generally PREFER the smooth landscape of Eastern Colorado, though we genuinely LONG for the grandeur of the Mountains. However, mountains are only formed by upheaval… and they are more prone to upheaval. I recall road-biking with my dad. I preferred the Eastern flat, but the ride up the Big Thompson canyon to Estes Park brought glory and joy and accomplishment (amidst personal PAIN and upheaval). In fact, nothing about the mountains is easy – whether a hike, or cycling ride, or cross-country skiing saunter. Even more, the “better” the climb (Longs Peak at age 11), the worse the upheaval and AGONY. That is the way of the mountains. That is the memory of my childhood. That is the way of church planting. That is the reality of my present. While in truth, I might prefer to walk away from the cell phone and busyness and just hike a mountain with my family (its in our family blood, both Kori and me), the reality is that the Lord has set the Powells on a mountainous climb, spiritually speaking. We have seen the grandeur of the kingdom of God through church planting in a way that (I don’t think) other paths would have afforded. Just the same, however, we have experienced the shifting rocks under our feet. We have slipped time and again, our breath is short, the climb is stressing. Lina is now hiking with us (she is aware of the strain), Meggie needs to be carried now and again, and Nate – well, he’s still in the hike-pack (but he’s heavier now). I never dreamed 3 years ago that our family would experience the goodness and glory and awe of ministry in such a ‘mountain-parabolic’ way. Kori and I continue to see how the gospel for sinners (Cheer up, you’re worse than you think, but you’re also more loved in Christ than you ever dared imagine!) is the WHOLE of our Christian life, and is the growing hope of our kids. Thank you God! We are growing in our connectivity to the “West Valley.” Community needs are now being directed to us by business and community leaders, who have seen that we are passionate about being a blessing amidst the brokenness. Our Main Street location has become a strategic gathering point – as neighborhood people have discovered us and boldly begun a journey of faith, beginning their hike wherever they are. Praise God for his connecting with his people through the preached word in the book of Ecclesiastes! The entire book is about the upheaval of life under the sun, and we are seeing MANY long for the hope of the gospel in all its grandeur through such an honest assessment! 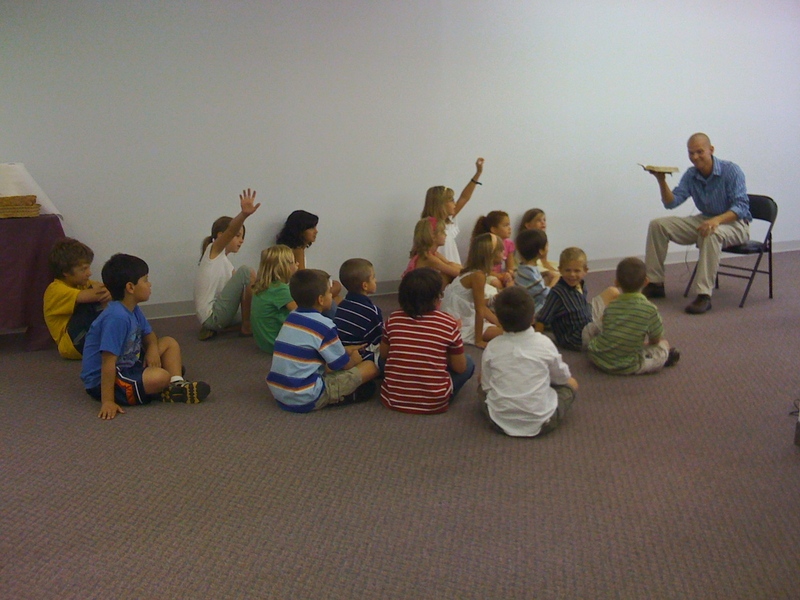 In September 2008 we gathered as 60 adults/children from Cornerstone PCA. In March 2009 we are at the tipping point of having more new regular attendees than mother-church missionaries. We are becoming a church for the West Valley! Upheavals of personal faith. God has drawn people to our church who are ready to journey the mountain… so long as they can freely (perhaps skeptically) hike at their own pace. People are looking for answers – but NOT pat answers! Please pray for wisdom, as our feet often slip on shifty ground. Please pray for my confidence in the power of the Word of God to change hearts. Pray for conversions by God’s Spirit through his church! Upheavals in finances. Please pray for the job-loss and job-stress from which we have not been immune at West Valley. Upheavals in the ‘West Valley.’ Please pray for our community involvement, as we are seeking to provide work and housing – mercy and grace – to the poor and hurting who are in our very community. May we realize that “ignorance is really ignoring which is really oppression” (my summary of Ecclesiastes 5:8). How will our presence in this community change the physical, emotional and spiritual lives of the people in this place?! Upheavals in churches. We are so thankful to be seeing the beauty of God in such visible ways as a young church plant. Please pray for the churches of our Presbytery, many of which are struggling financially in the economic landscape. These churches have sacrificed to launch us out… and yet they are exhausted from their climb in the Northeastern spiritual terrain. God give them grace. We praise God for your partnership on this climb. It has been a YEAR now since many of you received our first “give us money packet” (as I was once heard it so affectionately called). THANK GOD FOR YOU. We are seeing the kingdom come in our West Valley as it is in heaven. We need continued prayers for wisdom to be good stewards of the mystery of the gospel and the gifts of God’s people. We need continual financial partnership to saturate this one-million person Lehigh Valley with the gospel! As the Lord led some of you to pledge annual gifts, would you please prayerfully fulfill your desire? Many thanks, and to God be the glory!